School starts tomorrow for Austin who is now going to be in Grade 11 (junior high in the US). I wasn't too surprised when he wrote down a list of what he wants for his lunches and snacks. My boy has always been pro-active with meal planning at home. He sometimes even has meetings with me about our weekly menu, believe it or not. So here's part of his list: "blueberries, peaches, cut up veggies and one of your dips." Wow, where did the time go? I seem to have been stuck in a summer kind of mindset...so hard to let go. I can't believe it's back to school again. 1) Chemicals, additives and preservatives are added to processed foods (even in salad dressings) to extend their shelf life. 2) Deli meats are cured with chemicals like nitrates and are also high in salt and fat so these should not be the the ideal choice for our children's lunch. 3) Ingredients on mass produced food items do not have the highest quality ( rancid or refined oils, high fructose corn syrup, sugar, genetically modified and food dyes). 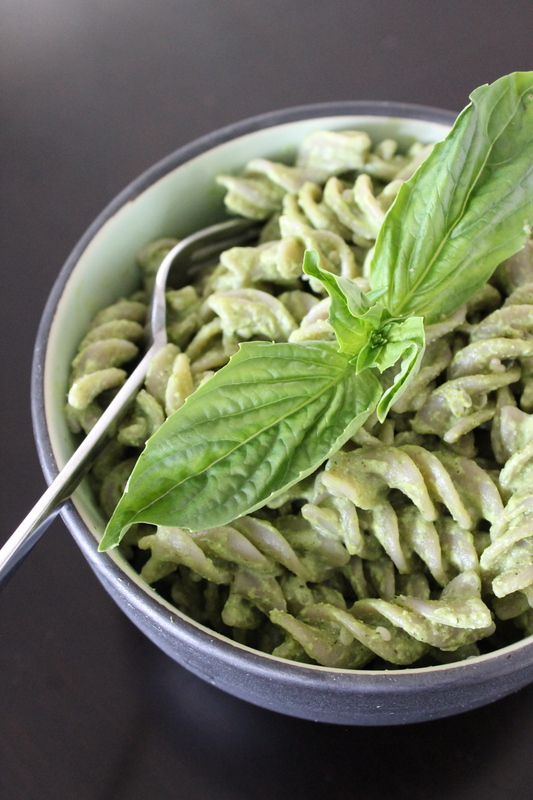 My son has a few meatless days during the week and this pesto sauce with gluten-free pasta is one of his favourites (I used it on wild rice pasta today). I keep a jar of this sauce in my fridge...handy, convenient and delicious. Conventional pesto sauces are usually heavy in oil and Parmesan cheese. I find that too "rich" for my taste so one day I thought of using hemp hearts, omitting the oil and substituting it with lime (or lemon) and water...perfect mix. Blend all but the last ingredient until you reach a creamy and smooth consistency. Adjust the taste...add more water or lime as needed. Mix the extra hemp hearts into the sauce. Enjoy! Please feel free to use a little oil if you prefer. I use lemon or lime depending on what I have available and it works either way. This mixture can also be thinned out with a bit more water or lime/lemon especially when using it on pasta. This is also good on raw zucchini pasta, as a topping to roasted veggies, fresh heirloom tomatoes or in raw or cooked tomato soups. Before I forget, I must mention that I also add this on balsamic vinegar dressing and it's delicious! You can also try a different variation of this sauce in this older recipe here. Happy first day of school to everyone! I wish all the children (and all the parents too) a great school year.